When you know your online target audience, you improve your chances of ranking well on search engine results pages. A great way to get to know both past and current members of your target audience is to interview them to find out more about them. A typical method is to ask users to complete a form on your Web site. It might be a sign-up form at the beginning of your conversion process, or a feedback form you pop up on the screen at the end of the process. Or you might prefer to interview the old-fashioned way and directly contact people by mail, phone, or e-mail. A survey can work great, although you may need to offer some incentive to the user for filling it out (a discount, a coupon, or some other prize). You can e-mail people a link to complete a survey online. 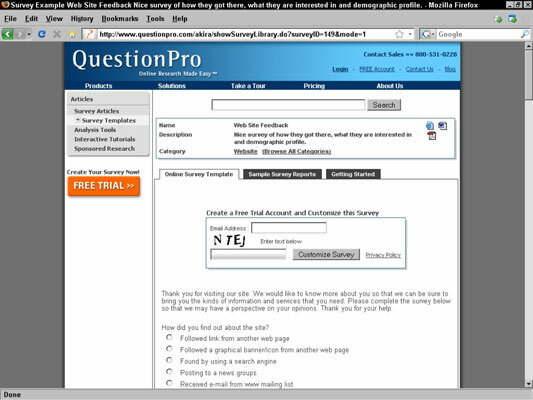 Sites like www.questionpro.com make setting up an online survey very easy to do; you just need to plan the questions you want to ask (see the below figure). The costs can be nominal, depending on what services you use. Online surveys are easy to set up and can be inexpensive, too. How often do they go online and how long do they spend there? Which of your competitors’ sites do they visit? The answers to these questions give you an idea of how tech-savvy your customer base is. For instance, the Microsoft Internet Explorer (IE) browser currently dominates with roughly 75 percent of total market share (because Windows comes with IE preinstalled). However, the Mozilla Firefox browser tends to be heavily used by people in Web technology fields (such as search engine optimization, or SEO). So if you find your users prefer Firefox that might be a clue that they’re more technical than the average user, which can influence how you set up your Web site and write your content. On the other hand, if your users get to the Internet through their AOL interface and stay there throughout their Web session, you know you’re probably dealing with a less technical user base. If you have any professional associations in your industry (the SEO community has SEMPO, for example), check with them to see if they’ve done any demographic research, which is likely more cost-effective than conducting your own research. This is a particularly good idea for a new site that might not yet have a large user base to interview.